Shalom everyone! I apologize for not posting anything last night. When you lead a tour, sometimes there are things that you need to do to make sure everything is set up and ready to go. We started yesterday morning at the top of the Mount of Olives. After taking our group picture, we were able to view this beautiful city and discuss many of the Biblical events that happened within the view. We then walked down the Mount of Olives to the traditional site of the Garden of Gethsemane. The City of David was next on our agenda. After viewing the possible remains of the palace of King David, we walked down to the Gihon Spring. Most of our group then walked through Hezekiah's Tunnel, which still has water flowing through it 2700 years after it was built. After lunch at Ramat Rachel Kibbutz, we drove to Bethlehem. We stopped by Kando's Store and viewed the largest Dead Sea Scroll jar that has been preserved. From here, we went to the Church of the Nativity, the traditional site of the birth of Jesus. This morning, we started at the Western Wall. This Jewish holy site is always a highlight of the tour. Everyone had the opportunity to touch the wall and have their picture made in front of it. We then went through the Western Wall Tunnels to view some of the huge stones that comprise this massive building effort by King Herod. After a stop by the Pools of Bethesda, we walked the Via Dolorosa to the Church of he Holy Sepulture. Tourism is very high here in Israel, and the church was no exception. I estimate that the queue to see inside the crypt was at least three hours. It was now lunchtime and I wanted to visit one of my favorite places, Jacob's Pizza near the Jaffa Gate. I mentioned it to the group, and before I knew it, nearly all of the group was following me to taste this homemade pizza. It was delicious and I'm glad that everyone enjoyed it. After eating, we walked through the Spice Market and saw different sites in the Jewish Quarter. We ended the day by touring the Davidson Archeological Museum and sitting on original temple steps from the first century. A great way to end the day. Tomorrow, we will head to one of my favorite places in the land, the Shephelah. NOTE: I am continuing my series of retrospective posts on the our tour one year ago. I invite you to start at the beginning and read through all of them. Located just six miles south of Jerusalem, is the town of Bethlehem. This was the town that David was from. And, it was the town that Jesus was born in. We visited the Church of the Nativity, which sits above the traditional location where Jesus was born. From there, we traveled to the Shepherds' fields and then to the Herodium. Tomorrow: The Israel Museum and Ashkelon. Have you been enjoying these posts on last year's tour? Are you interested in traveling with me this year? Then, I would love to have you join me. Our 12-day tour is scheduled for October 12-23. We will stay one night on the Mediterranean Sea, three nights on the shores of the Sea of Galilee and five nights in beautiful Jerusalem. During the day, we will visit dozens of sites that will enhance your understanding of the land and of the Biblical stories that take place in them. Reservations are coming in, but we still have some availability! This is a first-class tour with many extras thrown in that many Israel tours overlook. If you are interested, I encourage you to read the itinerary and contact me personally for more details. It is amazing what a beautiful day that we had today. The sky was a crystal blue with only a few puffy blue clouds. We started the day at the top of the Mount of Olives. This is easily one of the most memorable views on the entire trip. You can easily visualize thousands of years of Biblical history from this one spot. We stood up there for nearly half an hour pointing out different sites and discussing the last full day of the life of Jesus. We hiked down the Mount of Olives all the way to the Garden of Gethsemane. The Church of All Nations currently sits on this site. We toured the inside and outside of the church building and considered the great group of people that came down from the city to arrest Jesus on that fateful night. Our next stop was at the Garden Tomb. This site is run by a group from the United Kingdom. For many years, they laid claim that this was the actual site of Calvary. But, in recent years, have backed off that claim just a bit. Regardless, it is a nice visual of an ancient rolling stone tomb. After lunch, we drove down to the Herodium. This small mountain was constructed by King Herod to be his final resting place after he died. The view to the south from the Herodium was breathtaking. You can see the beautiful Wilderness of Judea as it stretches toward the Dead Sea. After a brief stop by the Shepherd's Fields, we arrived at the Church of the Nativity in Bethlehem. This church sits on top of the traditional location of the birth of Jesus. There is some considerable reconstruction work going on inside the building. In fact, there was so much reconstruction, you could barely identify the actual building amidst all of the scaffolding. Luckily, the crowds were very small and we were able to make our way down to the grotto fairly easily. We ended our day by visiting Kando's Store in Bethlehem. The owner of the store is Shibly Kando, the grandson of an antiquities dealer who was contacted by a cobbler who first came into contact with the shepherd who found the Dead Sea scrolls. He is a very kind-hearted man and I enjoy going to his store very much. Currently, there are four original Dead Sea Scroll containers on display. One is in Rome, two are in the Israel Museum and the last one (and largest) is at Kando's Store. It is a beautiful piece. Tomorrow, we head down to the Dead Sea. It will be warm, but enjoyable. This morning started out on top of the Mount of Olives. 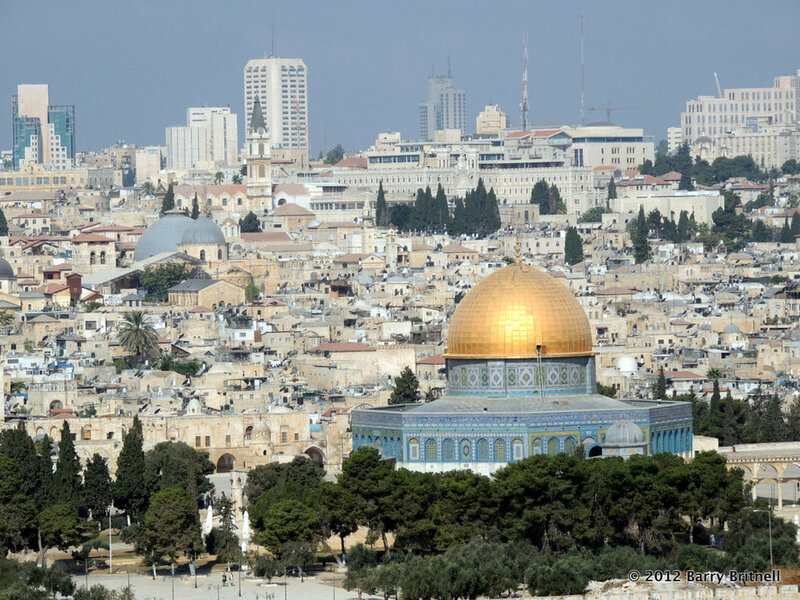 For anyone that has been to Jerusalem, the view from the Mount of Olives is something that you will never forget. This morning was no exception. When I woke up this morning, there was some clouds in the air and I thought that our view would be obscured. However, within 30 minutes of the sun coming up, the clouds burned off and it was crystal clear from up on top. We took our typical group picture which you will probably see on Ferrell Jenkins' blog. We traveled down off the top of the hill and down to the traditional site of the Garden of Gethsemane. It is interesting to look up at the East Gate and envision Judas and the men with him traveling down the hill with torches and spears to arrest Jesus. Standing there, you realize how close all of these places are. No doubt, Jesus could hear the men leaving the city and coming down to arrest Him. He could have had plenty of time to run, but He didn't. And for that, I am thankful. Going into the modern city of Jerusalem, we visited the ancient city of David. It is very interesting to walk around the ruins, see the ancient walls of the city and to see the Gihon Spring. From there, we walked through the Caananite Tunnel, which carried water from the Gihon Spring to other parts of the city during that time. Our tour ended by looking at the excavations of the Pool of Siloam. This is one of my favorite places. Mostly because I love the story in John 9 of Jesus' compassion in healing the blind man at that pool. The afternoon was spent down in the Bethlehem area. Even though Bethlehem is only 6 miles from Jerusalem, it is within West Bank territory and difficult to get to. We made a stop by the Church of the Nativity, which is the traditional location of the birthplace of Jesus. We had one final surprise stop at the Herodium just south of Bethlehem. We were not able to tour the Herodium (which is on my bucket list), but we were able to drive up to it and take pictures. All in all, another great day in Israel. It's quickly coming to an end, but we still have a lot to cover. Tomorrow we head south and go to Masada, En Gedi, Qumran and Jericho.